New York’s contest against Cleveland, played before a crowd peppered with a surprisingly large number of Giants fans, was a “grand one.”6 Giant center fielder George Gore led off the first inning with a four-pitch walk and Mike Tiernan followed immediately with a home run. The Giants scored again in the fourth when Art Whitney’s sacrifice brought in big Roger Connor from third. 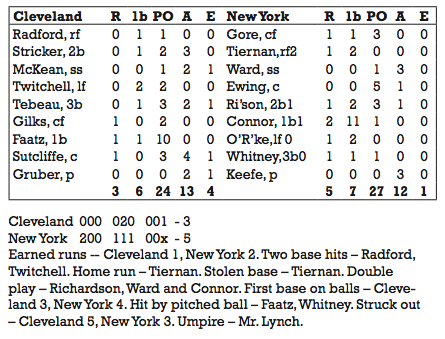 Cleveland narrowed the score to 3–2 in the fifth inning, when Paul Radford doubled home Jay Faatz and Sy Sutcliffe, but New York responded with a run in the bottom of the inning and another in the sixth. 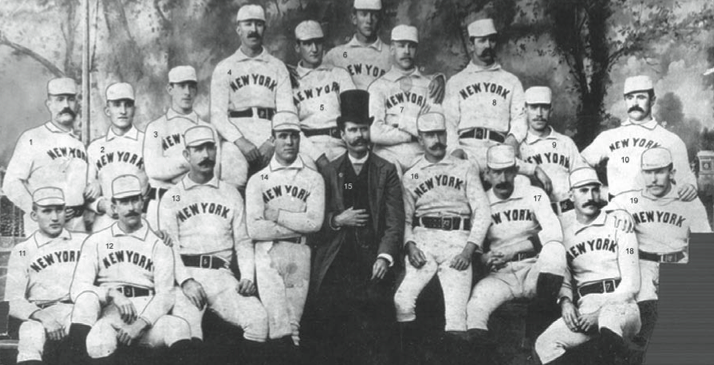 Sutcliffe drove in the Spiders’ Bob Gilks with a sacrifice fly in the ninth inning, but a fly ball by Cleveland pitcher Henry Gruber to Gore ended the game with New York a 5–3 victor. Keefe was almost as good as his promise, striking out five and yielding only six hits. Within weeks, the mood had soured: Ward’s Brotherhood issued a manifesto declaring that “players have been bought, sold, and exchanged as though they were sheep instead of American citizens.” Within months the new Players League began play. Although it lasted only one season, the league ripped away the core of the Giants and pushed John Day toward financial ruin. New York would not be National League champion again for 15 years. 1. Chadwick, H. “Editor’s Open Window,” Outing: an Illustrated Monthly Magazine of Recreation, April 1889, p. 14, 1; Kieran J., New York Times: January 7, 1931; New York Times, April 24, 1889. 2. New York Times, April 24, 1889. 3. Koppett, Leonard. Koppett’s Concise History of Major League Baseball, p.58. 4. Pearson, D.M. Baseball in 1889 (1993), p. 152. 5. Seamheads.com, http://www.seamheads.com/2010/08/06/ part-two-the-story-of -the-1888-1889 Giants. New York Times, October 5, 1889. 6. New York Times, October 6, 1889. 7. Boston Herald, October 6, 1889. 8. New York Times, October 17, 1889. 9. Sporting Life, October 16, 1889.